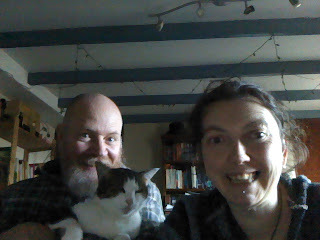 Then something great happened - a new job came along & then another one & suddenly we've realised that we're going to be busy again, especially around Christmas, so the heat is off. We had a good chat with our landlord, his Wife & Son - they don't want us to leave & for some reason, they think we are wonderful (we think they are too)! So now one of our dreams is about to come true - they've given us the go ahead to start doing B&B - yippee! The weather changed last night & has now got much colder, but yesterday it was fairly mild, so we had a walk along to the Donkeys Coffee Morning. The Donkey Barn - books, cakes & pickles for sale on the right. We've been out with the home ed group today - to an amazing place & had a great time! I'm glad to discover that is the donkey barn, I was thinking you'd a lot of work to do on the house to be ready for B&B in the Spring, otherwise. Glad everything sorted itself out, that must have been a worrying time. I'm not surprised your landlords want to kep you, with your positive and cheerful outlook on life, you must be a pleasure to have around. Awwww.... the little donkeys are so cute! And of course kitty is too! And add Kay and Sime to that as well! Cute cute cute! Thank you Catherine too - you are very sweet! I am so happy to hear about your new jobs. A B&B - how exciting!! Those donkeys are the sweetest things.